Are you the owner of a small business? If you are then learning how to properly manage and nurture your leads should be one of your main priorities. Because leads, as you probably already know, are vital to the growth of a company. This is not surprising: Without customers your business cannot grow. As a business owner, it is therefore imperative that you arm yourself with the tools necessary to achieve better results at a faster rate. Lead management software can do just that. Don’t believe us? Just check out this HubSpot article about lead management and lead nurturing. “Companies with mature lead generation and management practices have a 9.3% higher sales quota achievement rate.” In other words, the more attention you pay to sales leads, the more results you are bound to see. Thankfully, this can be done through a lead management software, or in certain case a CRM software integrated with this feature. Today, we will look into two lead management software for small businesses: Namely, Zoho and ClickHook. Keep in mind, however, that those software are only two of many. What works for us might not work for you. The key is to do your research properly and to always identify your main goals before settling for a software. Lead management has the potential to be either complicated or simple. Zoho combines all the features that you need, in the process making lead management simpler by dividing it into four stages: lead generation, lead assignment, lead qualification and lastly, lead conversion. So what exactly separates Zoho from other lead management software on the market? Quite simply, its simple, non-fuss approach to lead management. Too many software tend to be complex and cluttered. We believe firmly that the more complex a software is, the less effective it is. We love software with a focus and the ability to combine everything that you need into place. Zoho is a wonderful example of such software. 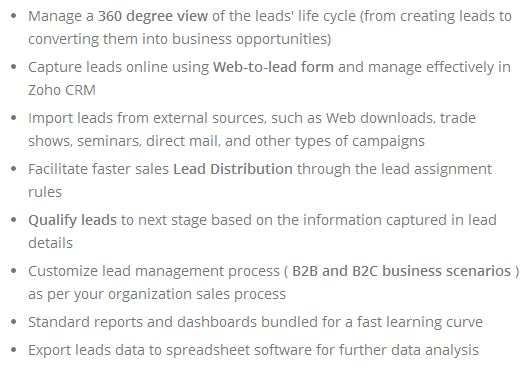 Another lead management software for small businesses meets the criteria that we stated earlier. While it is relatively new on the market, ClickHook is already making waves in the CRM lead management industry. Small, simple and practical, ClickHook is ideal for small businesses. Here’s why: They don’t need what they can’t use and they certainly don’t need what they can’t understand. As we stated above, we are big advocates of small and powerful software that combine everything that a small business needs to grow bigger. This is another reason why we usually recommend people to buy lead management software specifically focusing on leads rather than a CRM that does everything. The more focus you have, the better. Editors Note: ClickHook has now updated their back-end and it’s even better now. They have changed the name “sales-flows” to “work-flows” and you can setup as many work-flows as you like for each lead source you may have. The work-flows now have metrics integrated into them so that you can see where your best leads are coming from. Sounds good? We thought so. And the good news is that ClickHook is bound to improve even more as the months (and years) go by. If you are interested, check out ClickHook Beta for free — you really have nothing to lose in this case (and everything to gain)!